Anyway, since I can’t really share my knitting at the moment either (I have 3 sweaters due back in the US by June 19! ), here are some other things I’ve been up to, mostly from Instagram. Dale and I went to the Knitter’s Frolic on April 25 and had a great time! I know I haven’t been around much in the local knitting circles, so it was nice to see knitters I know from here and afar. 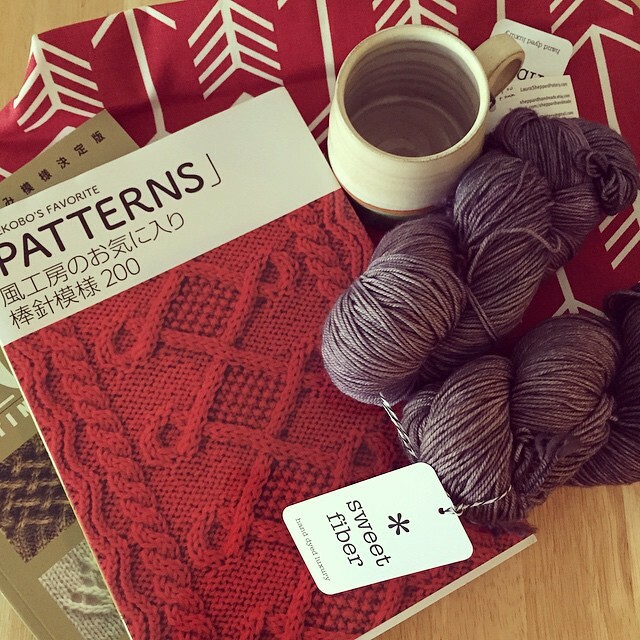 I didn’t buy much, but I did pick up a few new books, a sheepy mug from Sheppard Handmade, and a couple skeins from sweet fiber. 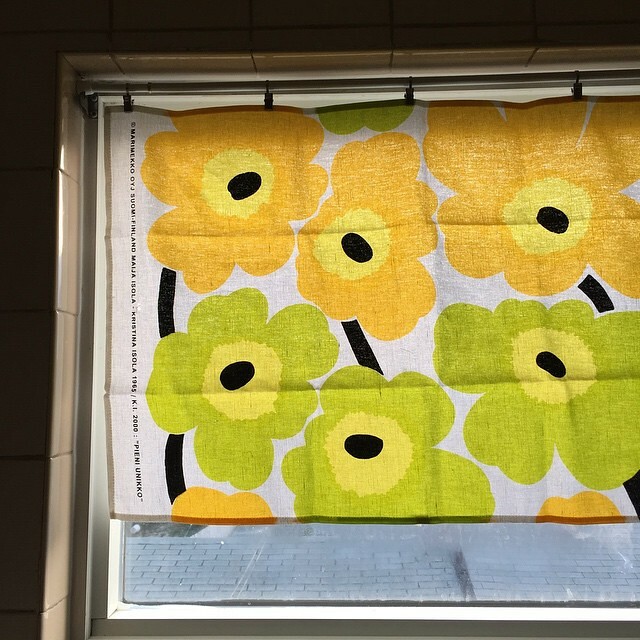 I finally got around to hanging a tea towel as a curtain in the bathroom window. I think it’s quite cheery! 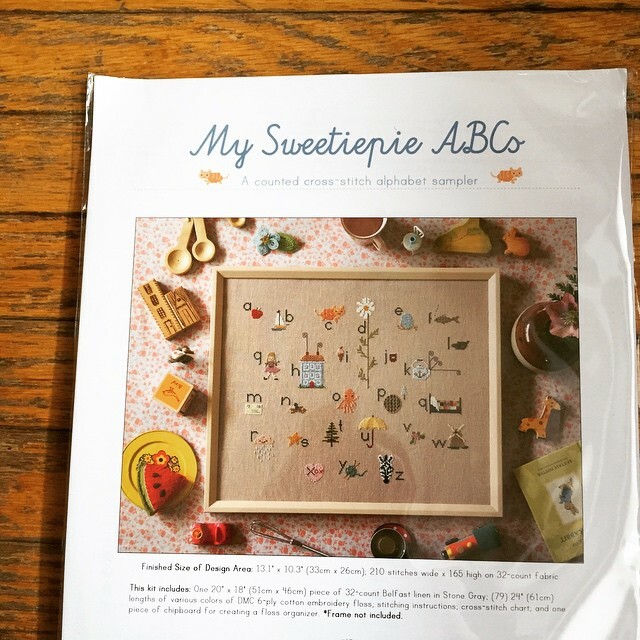 I ordered this awesome sampler from Posie Gets Cozy, I had such a nice time stitching her previous sampler so I’m hoping to get to this one sooner rather than later. We spent hours and hours on the weekend making macarons and they are super good. 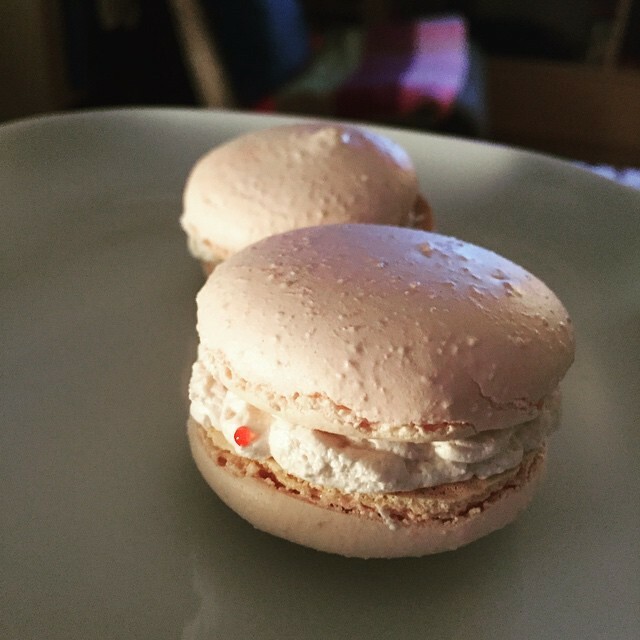 I used the recipe from the Bouchon Bakery cookbook, which has some extra steps over most standard macarons recipes I see, making a syrup of regular sugar and water to stream into the egg whites, which stabilizes the meringue and really makes it easier to get good results! We used meringue buttercream for the filling, in vanilla and raspberry. So, so good. Now that I know the process, I can really jump into flavourings! I too have been finding blogging a little bit more of a chore lately, but I wonder if that’s because I let it slip out of routine… For sure Instagram has something to do with it though — I post there and then feel like I don’t need to blog, or only need to blog when I’ve finished something. I wonder if that’s why sewing has taking off. More FOs, and more groundswell, the way that knitting kind of took off what, six/seven years ago? Hello! 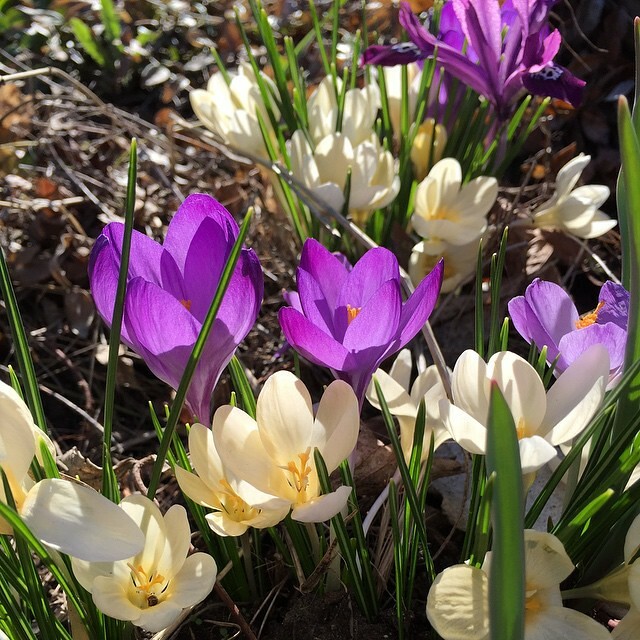 Thanks for the mention! You know, sewing bloggers are forever bemoaning that we don’t have an awesome online community like Ravelry, but certainly from talking to my sister Anne (aka. @anniebeeknits) it’s clear that Ravelry is gradually taking away the mojo from knitting blogs! Guess nobody has it perfect. :) Instagram has really changed thing in the sewing world, especially for something like Me-Made May. Now I can’t believe that I used to blog every. single. day. in May, and so did everybody else! I’ve been coveting that cross stitch sampler BIG TIME. I should get it, right? I haven’t touched her crewel alphabet sampler, though I’ve had it for years… maybe I should do that one, first? Is that the one that you’ve already finished?